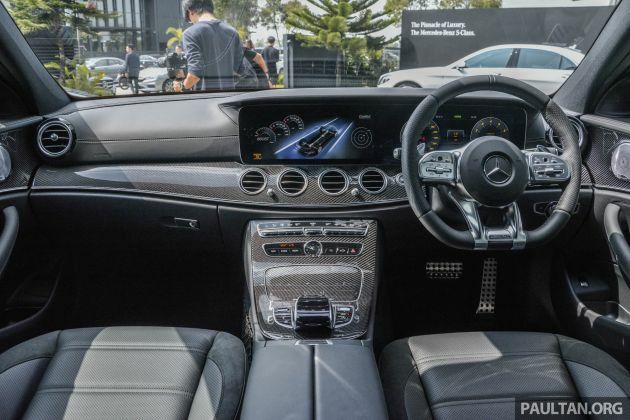 On top of announcing its performance results for the third quarter of 2018, Mercedes-Benz Malaysia has also previewed the Mercedes-AMG E 53 4Matic+ today, one of the six new models set to be introduced in the fourth quarter. 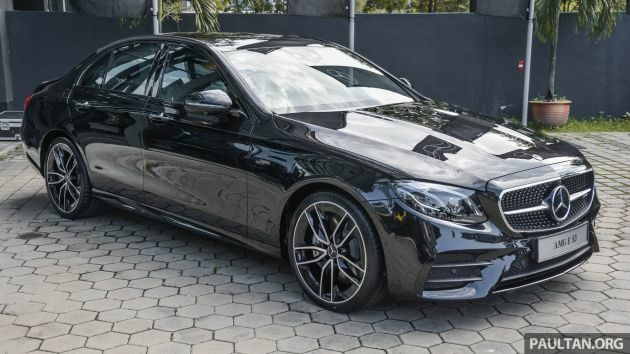 Available as either a sedan or a coupé, the mid-range AMG model replaces the E 43 and remains a more affordable rung in the Affalterbach ladder leading up to the fire-spitting, V8-powered E 63. 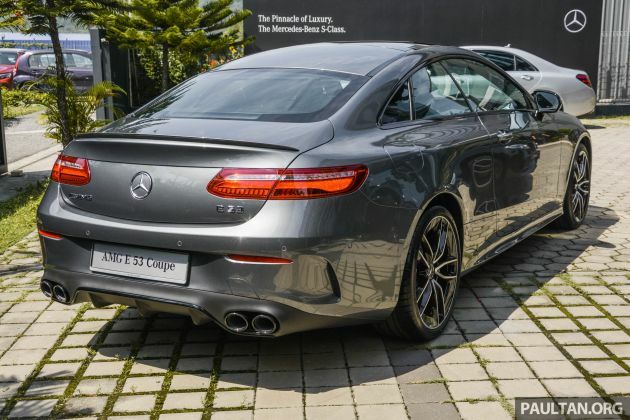 Pricing is estimated at RM740,000 for the sedan and RM764,000 for the coupé, which would make the four-door around RM80,000 more expensive than the outgoing E 43, a car that was only offered as a sedan. The biggest difference is the introduction of the AMG’s first ever EQ Boost mild hybrid powertrain – already found in the CLS 53 – to supplant the older 3.0 litre twin-turbocharged V6. Although the new engine is similar in capacity, it’s now a straight-six and uses an electric compressor to supplement a conventional exhaust-powered turbo, eliminating turbo lag and resulting in a 34 hp increase to 435 hp and 520 Nm of torque. This compressor is powered by an 48-volt electric starter/generator motor, which can also provide an extra 22 PS and 250 Nm of accelerative boost if required. All this is paired to a nine-speed AMG Speedshift TCT 9G automatic transmission and an AMG Performance 4Matic+ all-wheel drive system, enabling the coupé to sprint to 100 km/h in 4.4 seconds; the sedan is just 0.1 seconds slower at 4.5 seconds. An AMG Performance exhaust system with switchable valves is included. Both cars are fitted with AMG Ride Control+ air suspension with Adaptive Damping System Plus (ADS+), and receive higher spring rates to reduce body roll and improve cornering stability. They also get special steering knuckles and load bearing joints at the front, which work together with the increased negative camber all around to enhance lateral dynamics. The larger brakes come with four-piston callipers at the front. You can tell the E 53 sedan apart from the older 43 through the redesigned rear diffuser integrating quad round tailpipes, plus a new 20-inch two-tone alloy wheel design you see here. It retains a full AMG Line appearance package with a more aggressive front bumper and side sills, as well as a small rear spoiler an AMG-badged grille with chrome pins. The coupé is all new and gets a dual-bar grille instead. Inside, both models are fitted with a new Nappa leather-trimmed flat-bottomed steering wheel (with Dinamica microfibre grips on the coupé) from the facelifted C-Class, along with AMG sports seats upholstered in Nappa leather; the coupé gains red stitching to go with its red seat belts. The two-door also has aluminium dashboard trim instead of the four-door’s carbon fibre. Standard equipment on both cars include Multibeam LED headlights, keyless entry, triple-zone auto climate control, heated power-adjustable front seats with memory, 64-colour ambient lighting, Air Balance fragrance, a panoramic sunroof, a rear windscreen blind, a handsfree powered bootlid, a Widescreen Cockpit with twin 12.3-inch displays, Comand Online navigation, Qi wireless charging and a 13-speaker Burmester surround sound system. Opting for the coupé adds a head-up display, while the sedan gets rear side window blinds. Safety-wise, both models are equipped with the Driving Assistance package, consisting of Distronic adaptive cruise control, Active Lane Keeping Assist, Active Blind Spot Assist and Evasive Steering Assist. Last but not least is Active Parking Assist and a 360-degree camera. The 4 door monster beast. Those who think this is just a staid E keras will eat its dust. Wrong segment. AMG GLC/GLE will eat that for breakfast. Volvo is more on mazda standard. Geely more on proton std. Poor P1 always want to be in the same gang as Merc. This to me is already good enough. Bang for the buck. The E63S is a fire breathing beast, but where can you find anywhere sane on the road to unleash all the German AMG horses. This is more usable power and that EQ system helps to save a bit (a small bit) of fuel. 4.5 seconds is no more special in todays world. Most super cars already doing 3.5 seconds and below. Now even Jap super car half the price also giving 4 seconds. This flashy behemoth of a car befitting a Whale. Head says sedan, Heart saya Coupe. History says wait for the facelifted range instead. where to buy semi-d for 800k? All the more for MBM to hike the price. Next up, A200 for 220k+.